Quickly align your dish with this compact Digital Satellite Compass. It's quick and easy to use and has an LCD backlit display. To receive a clear picture, the dish must have the correct Vertical (Azimuth) and Horizontal alignment. Vertical alignment, is the angle of elevation above the horizon whereas the Horizontal alignment of a dish, is the compass bearing the dish will need to point. Correct dish alignment can be helped with the use of the following item. 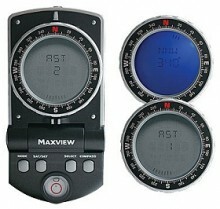 Click the button below to add the Maxview Omnisat Digital Satellite Compass to your wish list.